Egg pasta, chargrilled mushrooms and Parmigiano Reggiano cheese in a mushroom pesto dressing. 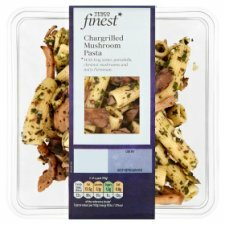 Tesco Finest Chargrilled Mushroom Pasta. With king oyster, portobello, chestnut mushrooms and nutty Parmesan. With king oyster, portobello, chestnut mushrooms and nutty Parmesan. Cooked Egg Pasta, Chargrilled Mushrooms (13%), Rapeseed Oil, Water, Parmigiano Reggiano Medium Fat Hard Cheese (Milk) (2.5%), Pumpkin Seed, Parsley, Basil, Malt Vinegar (Barley), Salt, Mature Cheddar Cheese (Milk), Thyme, Medium Fat Hard Cheese (Milk), Mushroom, Sugar, Cornflour, Regato Medium Fat Hard Cheese (Milk), Lemon Juice, White Wine Vinegar, Mustard Seed, Spirit Vinegar, Garlic Purée, Black Pepper. Cooked Egg Pasta contains: Water, Durum Wheat Semolina, Pasteurised Egg. Chargrilled Mushrooms contain: King Oyster Mushroom, Chestnut Mushroom, Portobello Mushrooms, Oyster Mushroom, Sunflower Oil, Salt, Garlic Powder, Black Pepper.